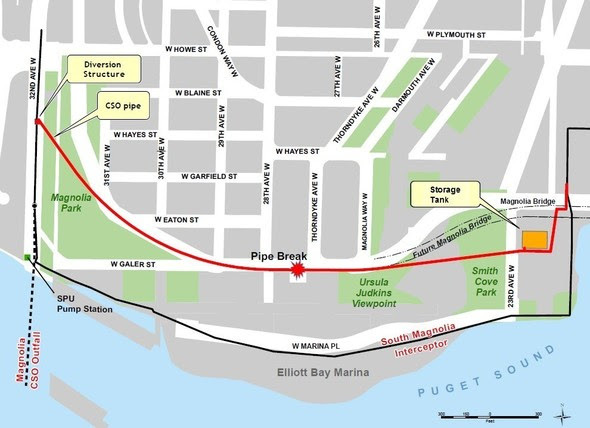 The week of Jan. 22, construction activities at Smith Cove Park continue as King County’s contractor prepares to connect another pipe to the Magnolia Wet Weather Facility as part of the Magnolia Conveyance Project. Crews may work on Saturdays during approved construction hours. Weekday construction hours from 7 a.m. to 6:30 p.m.
Saturday construction hours from 9 a.m. to 6:30 p.m.
King County’s contractor will begin staging on 32nd Avenue West early in the week. Traffic control will be in place, and delivery of equipment will begin. Depending on progress, crews may start work to access the diversion structure. The schedule and duration for construction is tentative and is subject to change as work progresses. We will continue to provide email notices with updates on timing of specific construction activities. Briefings and site visits: We will be working with community groups and neighbors to schedule briefings and site visits. If you would like us to attend your community group meeting or a neighborhood meeting, please feel free to email us. Email updates: We will continue to keep you informed through these email updates about what you can expect during construction. Online open house:· The online open house will be open for you to visit through the spring and will be updated, as needed, to provide an overview of expected construction activities. Please share the online open house with your neighbors who may not be on our email list. Hotline: We have a 24-hour construction hotline (206-205-5969). You may call with questions and concerns. Please leave a message with your contact number and King County’s team will get back to you. Contact us: Email Monica Van der Vieren (monica.vandervieren@kingcounty.gov) with your questions. Want to discuss the project? Contact Doug Marsano at (206)477-5549 or Doug.Marsano@kingcounty.gov.